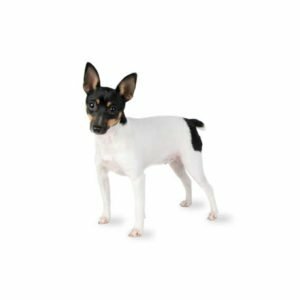 Truly an American breed, the Toy Fox Terrier is a big dog in a small package that possesses intelligence, courage and a take-charge attitude. Both a Toy and a Terrier, they are a true working dog, delighting in hunting tree squirrels and flushing out rodents. The breed?۪s colors are white, chocolate and tan; white and tan; white and black; or tri-color. To create this breed, the small Smooth Fox Terriers were crossed with various toy breeds including Miniature Pinschers, Italian Greyhounds, Chihuahuas and Manchester Terriers. The resulting dog ??? the Toy Fox Terrier ??? retained the gameness from the terriers and a milder, more “livable” disposition from the other breeds used. Toy Fox Terriers are an outgoing and friendly, yet fiercely loyal to their families. They are content and capable of any range of activities from hunting, to obedience, to just lounging around in the sun (or on the sofa). Children especially enjoy the unending energy and zeal for play throughout this dog?۪s life, but as with all Toy breeds, they are not recommended for small children. Their small size makes them ideal for an apartment, although they love to explore the outdoors. They are easy to groom ??? a quick weekly brushing to prevent shedding, nail trim, and occasional bath is all that is necessary. Are you interested in purchasing a Toy Fox Terrier?